Associated with the state of Jalisco, but eaten in many parts of the country, birria is a traditional Mexican dish most often made with goat meat or mutton, but beef, veal, or pork can also be used. It is served as a stew or can be used as a taco filling and is often part of the meal at celebrations such as weddings. Widely touted as a hangover cure, this dish frequently makes its way onto the brunch menus the day after a celebration. In Mexico, birria is sold at street stands or little mom-and-pop cafés. Many people will combine more than one meat in the same dish, so feel free to use the meat(s) that you like the most (or the ones that are on sale at the time) when preparing your own birria. You do need to plan ahead when you make this recipe as the meat has to marinate overnight. You will need a Dutch oven (or casserole dish) with a tight-fitting lid and a rack that sits inside. While there are multiple steps to this recipe, this Mexican birria dish is broken down into workable categories to help you better plan when cooking. Note: while there are multiple steps to this recipe, this Mexican birria dish is broken down into workable categories to help you better plan for preparation and cooking. Toast the chiles on a hot griddle or skillet over medium heat until browned, but not burned. Remove the seeds and veins and place the chiles in a bowl; cover them with very hot water for 15 to 20 minutes. When chiles have rehydrated, drain them. Process chiles and vinegar in a blender to make a paste. In a small bowl, mix together all of the rub ingredients. Rub the meat well with this mixture. Coat the meat with half of the chile paste. Cover loosely with plastic wrap and let it marinate overnight in the refrigerator. Pour the 1 cup of water into a Dutch oven or deep casserole dish. Add the coarsely chopped onion, bay leaves, diced garlic, and the remaining chile paste. Place meat on a rack that sits just above the water mixture. Place lid on the pot, making sure that it covers tightly, and bake for 4 hours. Remove the meat from the Dutch oven. Distribute the meat among six to eight bowls. Serve with broth (as a soupy stew) or as a saucy taco filling with corn tortillas. Brothy Variation: If you would like the birria to be more like a stew or soup, you can make the liquid into a broth. After removing the meat from the Dutch oven, let the liquid cool slightly and remove the bay leaves. Add enough hot water to the broth to make at least 2 cups and cook for about 15 minutes. Ladle the liquid over the meat and top with chopped cilantro and onion. Serve with a spoon and warm corn tortillas. Saucy Birria Variation: If you are planning on using the birria to fill tacos, you may want a thicker sauce. After removing the meat from the Dutch oven, remove the bay leaves from the liquid and discard. If the liquid is watery, reduce it by boiling it in a small pan to thicken. Break the meat into chunks and coat them with the reduced liquid. 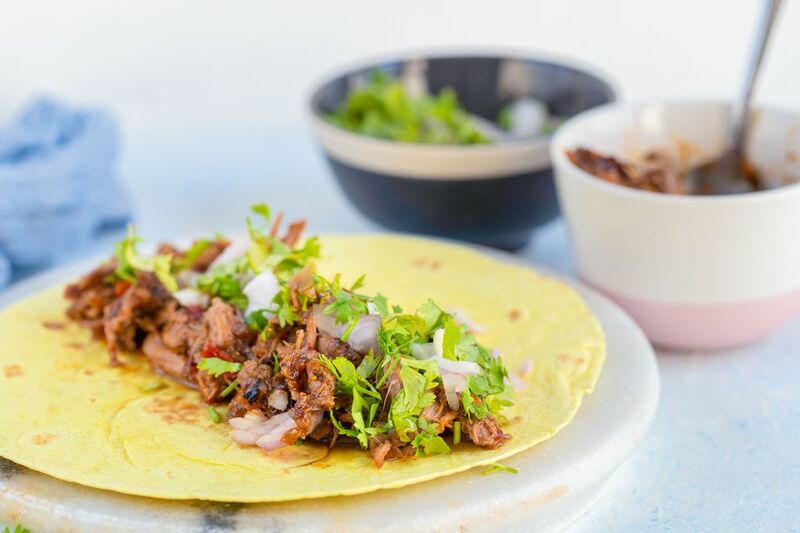 Fill warm corn tortillas with the birria and top with chopped onions and cilantro.